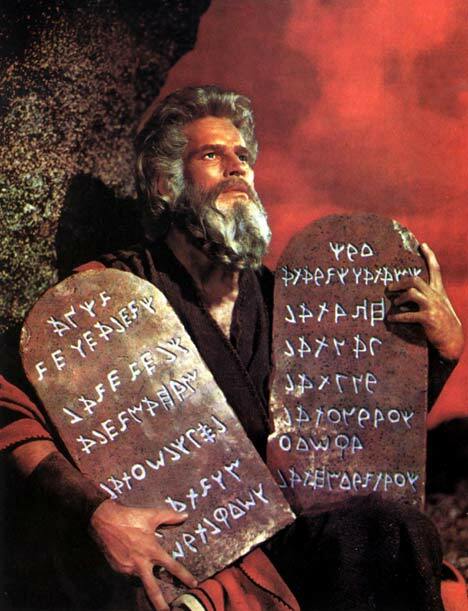 Ok so last night I watched the Ten Commandments on TV starting Charlton Heston as Moses. First of all, was “Charlton” a made up name by his parents when they couldn’t decide on Charles or Carlton? I haven’t heard of anybody ever named that. Secondly, let’s talk about the Commandments themselves. I can’t read that language on the tablets that Chuck is holding, let’s get a more legible version. Now as I read them, they seem like pretty standard “good person” stuff. Don’t kill, don’t lie, don’t cheat on your spouse, be good to your parents. Then there are also a few things pertinent to God. Seems fair. He wrote ’em, he’s allowed. The one I could never get my head around is “Thou Shall Not Covet”. First if all, who says “covet”? Secondly… uh what’s does covet mean? Covet: yearn to possess or have (something). So…We can’t want to have something? Seems counterproductive in a world filled with things. But if I want something REALLY REALLY badly, then I’m sinning. There’s no quality control against coveting. We can’t call 911 when someone covets. We’re all out there coveting with reckless abandon every single day without concern for our immortal souls. I say it should be 9 Commandments and 1 Suggestion. You always write interesting posts! i always enjoy your work and always get food for thought from your work. I’ve always found it leads to interesting discussions, in regards to the commandments, if it is considered a sin to think it in the mind or only if the act is physically committed. I personally don’t see how a thought can be policed. That’s ludicrous. You would be surprised (or not) that many people believe that “thinking it” is enough to be a sin. Blows my mind too. Heh..there are days when I feel like I am upgrading to a suite in hell…If I believed in that sorta thing! Covet is more that a wanting or yearning. It is a type of envy, wanting that of someone else and the obsession is unhealthy and the act of getting it is the sin. I would imagine that if thinking something (as opposed to doing it) was a sin we would all be in trouble….good post, as per usual!! You’re just worried you’re going to hell lol!